"Half as good as it should have been"
Kevin Smith's (Clerks, Dogma) recent foray into horror, Tusk, gets completely bogged down by a premise perhaps too lofty to complete successfully. Tusk opens on podcasters Wallace (Justin Long) and Teddy (Haley Joel Osment) deconstructing the internet's newest viral video “Kill Bill Kid”. As the men continue their banter, we learn Wallace has been invited up to Manitoba, Canada to interview the unfortunate internet celebrity. Upon his arrival, in the great white north, Wallace finds the interview cancelled indefinitely, and must make other arrangements. While drinking at a local hockey bar, he finds an intriguing letter posted to the wall by a man seeking companionship. Deciding to make his trip worthwhile, Wallace plans a trip to the man's house in the middle of the Canadian wilderness. What he ends up finding is the premise to the most bizarre horror movie ever crafted. When Kevin Smith announced his intent to make his own hypothetical podcast storyline a reality, Twitter users clamored over the proposed Smith horror film (voting #WalrusYes via tweet). When the trailer was released, and the reality of the film set in, everyone was salivating for a unique and grotesque take on the overdone medical experimentation horror premise. While I am certainly not the first to say this, I do admit that Tusk is indeed that film... for the first half of the movie. Suffering from a mood killing tonal shift during the second act, Tusk transforms (along with its main character) into a monster. What begins as a beautifully directed and totally unsettling horror film, instantly changes into a hokey and senseless piece of comedic garbage. Almost as if Smith, having actually pulled off some gripping horror, began chuckling wildly to himself while writing the script, and forgot that it should probably have an ending. What Smith pulls off in his first half is almost brilliant enough to make up for the latter half. Drifting suddenly to flashbacks and between storyline, Smith keeps his audience on their toes, and holding their breath. Smith knows his audience is waiting for the reveal of the monster he's created, and he absolutely uses it to his advantage. Following along with bated breath as Wallace discovers the horrifying plot, and is doomed to become a “medical” experiment, the audience is right where Smith wants; holding back laughter and bracing for impact. Then Tusk simply ceases to exist. Almost instantly turning into a complete farce, Smith seems to have listened to his doubters, and made a stupid movie about a man being turned into a walrus. 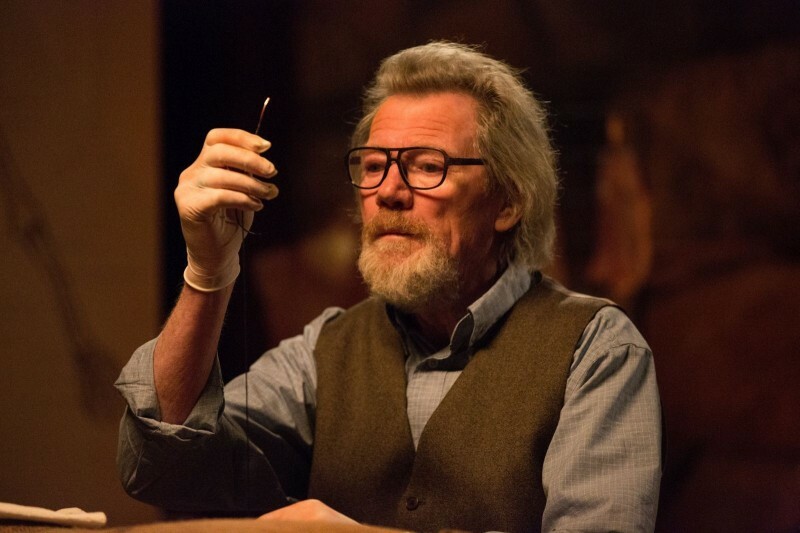 While completely lacking in cohesiveness, Tusk shines whenever the dastardly Howard Howe (Michael Parks) graces the screen with his disquieting presence. Bringing an unnerving eloquence to Howe, Parks seems to glide through his lines as if reading sinister poetry. With the appearance and disposition of a much older Walter White (yes, that Walter White), Howe's brilliance is only overshadowed by his insanity. Long is able to keep up with Parks' torment, and is able to show enough acting talent to keep the audience engrossed. Long seems genuine enough as the wise-cracking sarcastic podcast star, and pulls off the persona with the aid of a truly menacing moustache. The axillary cast range from the mediocre to the wildly unfunny (Johnny Depp, what are you doing in this movie?). While this is certainly not the first film based off of a bizarre personal ad (I'm looking at you Safety Not Guaranteed), it is without a doubt the first film based on a podcast centered around a personal ad. Bemusing in its premise, and so nearly realized, Tusk is a complete let down for those rooting for its success. Kevin Smith is known for his genre subverting films, and Tusk nearly deserves a place high amongst his best works; until he subverts his own efforts and bogs his film down with unnecessary cameos and heavy-handed silliness.